The high winds dropped enough for us to set sail late morning after mending the mainsail. One of the sliders that attach the sail to the mast was broken and a replacement has not yet arrived so we decided to move a good one from lower down the sail. This then meant that part of the sail isn’t attached to the mast so we will keep that part of the sail reefed for the time being. 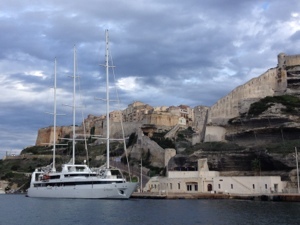 This didn’t seem to affect our performance today as we had a lovely sail from Palau to Bonifacio on the island of Corsica. The forecast was for light winds and rain but the winds held and we only got a shower or two until we had safely moored up – no thanks to the marina staff who were nowhere to be seen and when we called them on the radio, we were told to just find an easier berth. There are no easier berths when mooring stern to with only two of you on board and with very little room to manoeuvre! 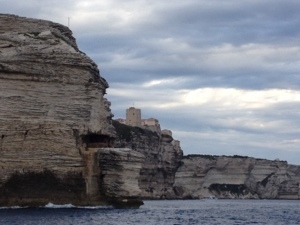 Bonifacio is an amazing place as it seems to have been built on top of the cliffs and the entrance is through a narrow channel between high cliff faces. The marina is in the centre of town and we have decided to stay here tomorrow to do some sightseeing and also find a French supermarket. 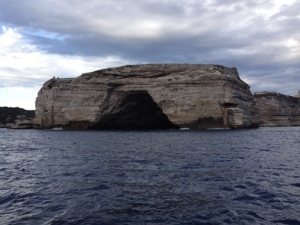 Pictures below of caves at the entrance to the marina, looking back at Bonifacio on the cliff top and Bonifacio marina. This entry was posted in News and tagged 2012, Corsica, France, Med. Bookmark the permalink. Looks great. Cant think why you want a french supermarket! !